Two years ago, I wrote down some thoughts around creating demand for your content with a very high level overview of the evolution of online content discovery (above). As I said in the post, when I started Conversation Agent, after the launch and heavy use of portals as the online one-stop place to find things, often tied to a free email account, being online and establishing an identity was tied mainly to having a blog. Blogs or at least a place where to outline ideas and collaborate on making them happen are making a strong comeback. I'll have more to say on this in a later post. For now, I'd like to tackle the evolution of content into digital products via some quick examples. Do you want to become a thought leader in a specific field? Create digital products that help people get stuff done, use products or services, learn a new skill, build a business. Some examples of people who built a business around creating a path for others through the use of content: Chris Guillebeau's products, the Codecademy program. Are you catering to a very specific group of people? Think categories like entrepreneurs, stay at home moms, students, and segments within them like solo-preneurs, partner entrepreneurs, bootstrapping, VC_funded, or stay at home moms who home school their children, students who are learning a foreign language -- just off the top of my head. Some examples of people who cater to specific groups: Kelley Crane for SoloPR, Liz Strauss and Terri Starbucker for creating Successful Online Businesses (SOBCon). Is your intention to become the go-to place for information and news on a specific topic, solving a certain problem? Some examples of this value proposition: Michael Port and Book Yourself Solid, Chris Garrett has a few products, each solving a specific problem. Do you plan to offer products and services for purchase directly? Many of the examples in the points above do sell products directly off their sites. And this is just the tip of the iceberg. Entrepreneurs and consultants have been leading the (digital) way that many organizations are now following. Thanks to the ubiquity of broadband access, the familiarity with technology, and the popularity of tablets, content consumption has gone way up. So much so that it has become viable for media companies to start packaging content for on demand viewing, especially in response to new entrants offering purchase of original content for streaming#, and for news organizations to start experimenting with new models that are not so dependent on advertising revenue#. Anyway, this is a lot of what I'm working on with media and entertainment companies and eCommerce clients, and I see the cross over very clearly. We're just scratching the surface on the opportunities. Swedish agency Forsman & Bodenfors was hired by SVT, Sweden's public service broadcaster, to launch their SVT Play app for iPhone to support their on demand web service. Besides having no media budget, the agency also had no idea when Apple would approve the app. One of the best ways I know of to demonstrate value is by showing customer demand for a product or serivce. F&B invited all the SVT Play fans to participate in a campaign to fast track approval for the app. They addressed the campaign directly to (then) Apple's CEO Steve Jobs. Once the news of the project got out, Swedish TV viewers got into it and generated much of the content for the campaign. The gaols was reached on launch day. TechCrunch, Gizmodo, Feber (Sweden buzz site), Creativity, Afton Bladet (Sweden's largest newspaper). Thousands of other sites also wrote about the campaign, including this one almost three years later. They reached 19,000 the day of the launch and had 117,468 unique visitors during the period the campaign was active. After one week, they had 389,000. 2 hours after the rlease, the app was the most downloaded in Sweden. It sounds like Swedish Television is worth watching... see the video for details on the program. The campaign caught my eye because we still rarely do that -- involve customers in our plans for them, which we then launch TO them, instead of with them. Note about content strategy: Do make your assets readily downloadable and sharable, and likely we will with more frequency. I was reflecting upon how many of the services we enjoy today stem from the early days of the Web. The graph above depicts the shift in focus and production from goods to the administering of services in the American economy. Products got progressively better with the introduction of technology, the ability to automate beyond production to qualitative measurements. Going back to my thoughts about the Internet and the Web where services improve the more people use them -- take for example, Amazon where customer reviews and interactions with the system produce better search results and purchases. The people who use your services add value in the form of data. That value is not realized until the organization uses the data to actually improve its services. And that increasingly means the way it delivers them, how it designs online or physical world flows as experiences. Take another look at the chart above, and what you may notice is that most of the organizations that are classified as being in the service business have operations as a core competency. How data is linked and mined to put products on shelves AND butts in seats. I just saw the new Hitchcock movie, which tells the story of the making of Psycho. While Hitchcock himself made cameo appearances in his movies, it was clear from the story that his wife held center stage in his creative life. In a way, both where there -- he in the movies, she in the plot, connections, script, and financing -- influential, yet not blatant or obvious. We should do the same with our marketing. Be there, focused on the the customer, designing service experiences that help them do what they want to do without making the exchange all about the business or the brand. Because it is often all about the experience of them -- and you. Can we make experiences both memorable and very personal? Through content, we can use the point of view, the guiding light of the editor, and the availability to hold our part of the exchange by being conversationalists and storytellers. Fear and fantasy are two of Hitchcock's key ingredients, always tempered with a good dose of humor and realism. In fact, the more realistic and reasonable the beginning, the more compelling the twist. Placing an ordinary person in extraordinary circumstances. We call that a persona. By creating an ordinary persona your readers can identify with, they will experience empathy for themselves. Show understanding of what they are going through -- their problems and issues. Especially through social, you have people like you and me telling stories we can all identify with. The case of mistaken identity leads to all sorts of twists in the plot. Think about treating a passionate advocate and fan as an influencer, a level or two above what you would normally consider. Help them be the hero, and they will bring you to the table. The villains in Hitchcock's movies appear refined and charming. Raise your hand if you thought that sales calls are interruptions. Today I received a perfect example of a charming one. He was polite, did not beat around the bush, got to the point without apologizing or trying to conceal what he was selling. We can market like that through conversation. They symbolize the unknown in marketing. Where do they lead? There is the allure of the glossy brochure, the courting through interactive marketing, then, at some point, we'd like some action. The stairway is where the prospect decides whether to follow. If we've done a good job at creating the right amount of positive resonance, they may trust us. Careful that it doesn't become the fire escape route. You know that inside every department in every company there is a hierarchy in the decision-making chain. Have you done your homework and gotten buy in from the people who have the power to say yes? The magic here is to work with the people who have the power to say no, not around them. The fastest way to kill your opportunity is to go around someone to their boss, who relies on them for a recommendation. Remember that. Take it to heart. This is an interesting concept. Hitchcock included brandy, a form of distilled wine, in all his movies. We live in an age of snack culture, where people consume media in small bites. Yet people are willing to invest time and effort on things that are valuable to them, things they want. How can you distill the information to be the right one, at the right moment? This is the want part of the marketing equation. Need leads to commoditization, want leads to consideration. A smooth marble countertop, a red Ferrari, a shiny new iPad -- all connections achieved through design. How can we design experiences that people want to have? Look at entertainment - Le Cirque du Soleil, a Broadway show, a prestigious gala dinner. People want to be there. They must. The classic point of view most evident in Rear Window. There will always be people up front, participating actively to conversations, and people who are on the fence, watching what is going on and forming their opinions. You may not be able to involve them directly. Yet, the mere fact of being aware they are there, will prompt you to address their potential concerns. This is the crime -- normal and expected in a thriller like Psycho. Breaking the rules works best when you've taken the time to know them, learn about the boundaries, research behaviors and reactions. Then figure out the opposite - zig instead of zagging - for example. Don't do it just to do it differently. Be smart about it. Know why. Don't forget that many purchases today are made by women. We think differently, so much so that in Kawasaki's book The Art of the Start, he advise start ups to consult with a woman to vet a business plan. Why? Women don't have the killer gene. They are thus much better judges of the viability of a business model -- and of a purchase. This is the moment you are shutting up and your customers are talking. It's the best moment, the one you have worked for all along. It's tempting to try to oversell. When the customer is talking and giving you an opportunity to help them, it becomes all about them. Forget shiny brochures, and make it a working session. Use what you have, and make the most of it, just like Hitchcock did in many of his movies. 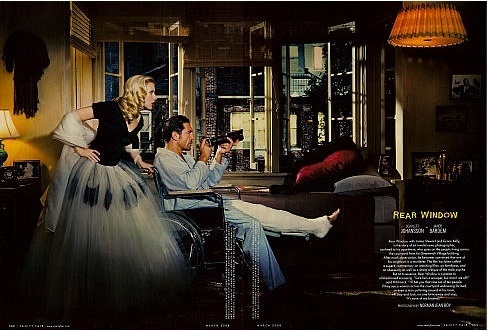 Did you know that Rear Window was filmed from the angle of one single room? How about Lifeboat? His cameo here was in a newspaper ad for a weigh loss product. Masterful. How can we be there by being focused on the customer? How can we make experiences that are both memorable and feel very personal? Customers are the stars, we're the cameo. This is a trend, and not a fad.When we talked about creative ways of going to the movies, we scratched the surface on what is to come. We're seeing it every day in our work -- thanks in part to better technology platforms and systems integrations and in part to savvier shoppers armed with a smartphone#, media companies that do well are learning to behave more like retailers. Guess where you can buy screening tickers for the upcoming Man of Steel by Warner Bros.? That's right, at Walmart. The company has been dedicating resources to identify how its digital presence can be as much a part of its customers’ lives as the stores are today#. Localize pricing and get the massive distribution power of a universally recognized brand that gets logistics, even when they are about putting people in seats. People who buy the advance tickets will also be able to pre-order the movie on DVD or Blu-ray disc. They will also receive a free digital comic book written by the “Man of Steel” screenwriter, David Goyer. Smack in middle, is the ability to book digital inventory while A/B testing markets, analyzing patterns, embedding social into the experience, and optimizing for that next time. A million years ago, I asked Conversation Agent readers -- Has Web 2.0 made you happier? It was so long ago that we've since stopped referring to it as Web 2.0. The responses may surprise you. I like discussions around thought provoking questions. Give me an open enough question, and I can facilitate a large room of individuals helping each articulate their point of view and be heard. For many years, I held these discussions in person, see building a platform here. In the first five years of this blog, the conversation was spirited. Then with the birth of all kinds of social networks, attention splintered. More than social fatigue, many have been experiencing social fragmentation, with shorter and shorter bursts of half thoughts scattered all over the Interwebs. Which is why I am fascinated by the Edge. As the site describes, Edge is a conversation that offers a high quality of intellectual adventure. The online salon at Edge.org is a living document of millions of words charting the Edge conversation over the past fifteen years wherever it has gone. It is available, gratis, to the general public. This year's question is what should we be worried about? [...] it also has implications for how all of us think, socialize, and in general live. If we assume that networks will continue to get faster—a pretty safe bet—then we can also conclude that we'll become more and more impatient, more and more intolerant of even microseconds of delay between action and response. As a result, we'll be less likely to experience anything that requires us to wait, that doesn't provide us with instant gratification. That has cultural as well as personal consequences. The greatest of human works—in art, science, politics—tend to take time and patience both to create and to appreciate. The deepest experiences can't be measured in fractions of seconds. I worry that in our haste to have all the answers, we may miss asking the most important questions. Curation properly begins with a mission statement, whether you’re a content creator or a researcher assembling resources: What is it you are trying to say? What does your collection represent? When you’re a content creator, focus becomes even more crucial. A good content strategist wouldn’t let you set up even a Twitter feed without a full understanding of how you’re going to use it and what it’s going to do for you. Are you a design firm looking for new clients? Sure then, use Twitter to talk about design in a public space. There is no One Best Content Strategy; it’s all about context. What do you need to say about who you are and what you do, and to whom? What do your users expect to find there? If a website has a clear content strategy, visitors will get more out of it with less frustration. Exactly what they get depends on the goals of each site, since a successful interaction could be quantified in any number of ways: tickets sold, pages viewed, orders placed, tweets twittered. A failed interaction is when a user doesn’t catch the underlying story or its relevance to their needs. A content strategy needs several elements to make it work. Not least of which, a plan to validate the content with users, and to keep it fresh. In addition to how much do we publish, where, and when, we should also think about how we organize what we have already published, including how we're going to handle stale content. While I've often tucked this idea into articles and posts, it is especially useful to review some of the reasons why your programs and resource investment may not be working as they should. This is kind of obvious, yet it bears repeating. In a rapidly changing environment that puts customers front and center, most organizations are not creating the most appropriate (and enjoyable) experiences for people. Which means they are unknowingly delivering disconnected impressions. Start with the job to get done. Does your product still fill a need? Is the service in need of improvement? Maybe the product is sound, works well, and can be truly useful. The signal vs. noise ratio has gone way up in the undifferentiated mass marketing. Hundreds of potential channels, screens, and networks to chose from, you're just not going to know which ones are in front of your prospective buyers right now. Your business already gets customers attention in the form of repeated transactions. Are you communicating clearly a personalized value proposition? Do your actions match your promises? Are the product/service delivery experiences consistently closing that gap? Do you make room for your customers to provide feedback and be part of the experience? When attracting prospective buyers, prioritize a series of easy actions, not just one transaction. Are you asking a small enough commitment and making it super easy? Do you make the experience compelling? Are you offering opportunities to validate your claims? Have you built a bridge to the next experience to help them come back? On the heels of a world where buying attention is getting increasingly challenging and (potentially) expensive, to get attention you need buy-in first. The bottom line: design to the way the business is. Whenever we think about memorable experiences a business can offer its customers, the end point or aspirational vision is often grand. It usually follows a pattern that has led us to professional success -- we've done it over there, with that other brand, and it worked. Two thoughts on why that will not work. While in the past it was sufficient to imitate a similar brand and adopt a slightly better formula to stand out, we live at a time when people can hire a surprising roster of brands and experiences to get the job done for them. A set of tools and companies we would not have considered competitors to that brand in the past. The law of incremental improvement works when the pain of switching is felt -- with customers. It works less and less with potential buyers with the cost of acquisition shooting upward, and the potential of never getting to second purchase or customer status. In fact, with telecom companies, sign up incentives encouraged switching among otherwise similar experiences and eventually created the backdrop for the success of mobile plans with free long distance and eventually Skype -- free global calls. It may sound good on paper to transfer success from one business to another. Without taking into account the business model and the culture surrounding the current experience, what makes sense in one environment, may break in another. The changes brought about at JCPenney by Ron Johnson are an example of forced fit -- the new experience left shoppers used to hunting for bargains with no jobs to be done. When we envision making the experience better, we need to remember and take into consideration the aspects of the current experience that work and design to that. Remove the quirky off a brand with a personality and you're left with a bland. We often discuss tools that allow us to become more productive by shaving time and effort out of processes. When traveling with some airlines we can choose to receive a mobile boarding pass. So I was thinking about tying the sign in process into a building to receive a scan code for access with a time limit -- in other words, it would need to be used within a certain time from entering the building. The act of scanning sends a message to the person you are visiting that you are there and records your visit into their CRM system. Just riffing here, we would want to think through the technology stack for execution, as as as opt in as you do with mobile airline apps and boarding passes. What do you think? Would you use such a system?